Wisconsin women’s hockey goaltender Kristen Campbell has been named a Top-10 Patty Kazmaier Memorial Award finalist. It marks the third-straight year a UW goaltender has been on the list as Ann-Renee Desbiens was a top three finalist in 2015-16 before winning the award during the 2016-17 season. Campbell leads all NCAA Division 1 netminders in shutouts (11), wins (29), save percentage (.942) and goals-against average (1.15) during her first year with the Badgers after transferring in from North Dakota. 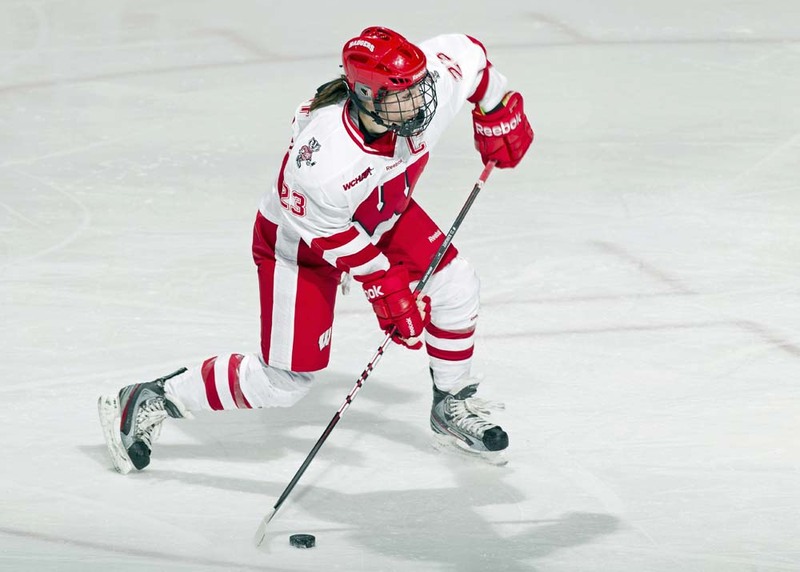 The Brandon, Manitoba, native has a 29-3-2 record in net for the top-ranked Badgers and her winning percentage of .882 leads the country this year. Campbell was named WCHA Goaltender of the Month three times this year, WCHA Defensive Player of the Week three times and twice was an NCAA Star of the Week. The Badgers are off this weekend, getting a first round WCHA playoff bye. They’ll open the tournament with a semifinal game on Saturday, March 3 at Ridder Arena in the Twin Cities. Wisconsin Badger senior Ann-Renee Desbiens and junior Annie Pankowski have been named top-10 finalists for the 2017 Patty Kazmaier Memorial Award, given to the Player of the Year in women’s college hockey. It marks the second-consecutive year that both players have been named to the top-10 list. Desbiens was a 2016 top-three finalist and leads the nation this season in every major goaltending category. The La Malbaie, Quebec native owns NCAA-leading marks in goals-against average with a 0.74 mark, save percentage with a .961 clip, winning percentage with a .893 rate and shutouts with 13.
the 10 finalists for the 2012 Patty Kazmaier Memorial Award. Knight, who has 28 goals and 28 assists in 36 games, leads the nation this season with eight game-winning goals. Decker, who scored in a team-record 32 straight games, leads the nation with 35 goals and ranks second with 77 points.